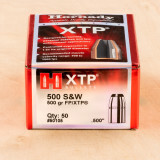 Hornady's FTX line is designed to give shooters consistent expansion across a very wide range of velocities. 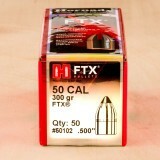 Each bullet in this box of 50 is .500" in diameter, weighs 300 grains, and features Hornady's patented flex tip. 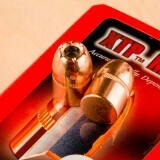 Flex Tip technology delivers controlled expansion paired with very flat trajectories. 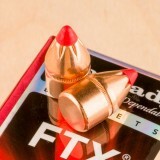 Hornady has earned a reputation in the industry for providing shooters and hunters with top-of-the-line products for all different applications. 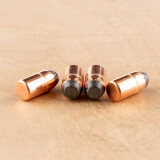 Widener's also offers powders and primers for all of your custom loading needs. 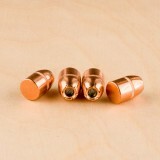 Don't forget to check out our selection of Brass, while you're here. 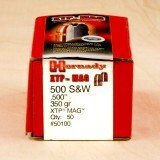 If you are looking for a premium, hard hitting projectile, Hornady has the product for you. 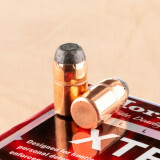 Hornady's eXtreme Terminal Performance (XTP) line is engineered for hunting, self-defense and law enforcement applications. 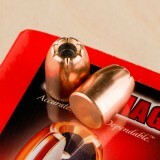 Each bullet in this box of 50 is .500" in diameter and weighs 350 grains. 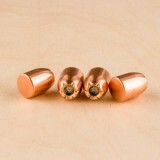 These projectiles have a tapered copper jacket that has precise serrations notched in the hollow point. This results in controlled and uniform expansion even at low velocities. 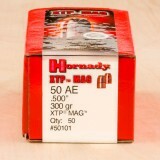 Hornady has earned a reputation for producing high quality products that exceed customers expectations.